A few weeks ago, I was lucky enough to catch one of the last days of the Metropolitan Museum of Art's exhibit of Turkmen Jewelry. It was a really beautiful collection of different kinds of jewelry and artistic pieces. Parts of it reminded me of some of the Yemenite jewelry that is somewhat commonly available in parts of Israel. The metal working in these pieces is absolutely stunning, and the level of skill required is something I can't even really hope to aspire to so long as I still want to also do other things in life besides make jewelry. What really struck me through this exhibit after having received my bead soup ingredients from Krafty Max was the mix of precious stones used - carnelian and turquoise. 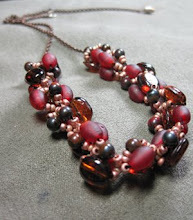 That mixture of colors is serving as some of the inspiration for my bead soup creation later this month.